After being vegan for about six months I think I’ve finally gotten a hang of this whole thing – and it requires a ton of cooking. For our favorite recipes we find ourselves coming back to the same ingredients. There are way more than five, but below is a start – these are ones we often buy in the bulk section and hoard away in our cupboards so we’ll never be without! Nutritional Yeast – If you once loved cheese, this is a must in your pantry. It gives the best nutty, cheesy flavor that doesn’t break vegan rules. We use it in sauces, gravies, and anywhere one might use parmesan cheese. Cashews – They give recipes a creamy, milky texture. sauce and cheese recipes. 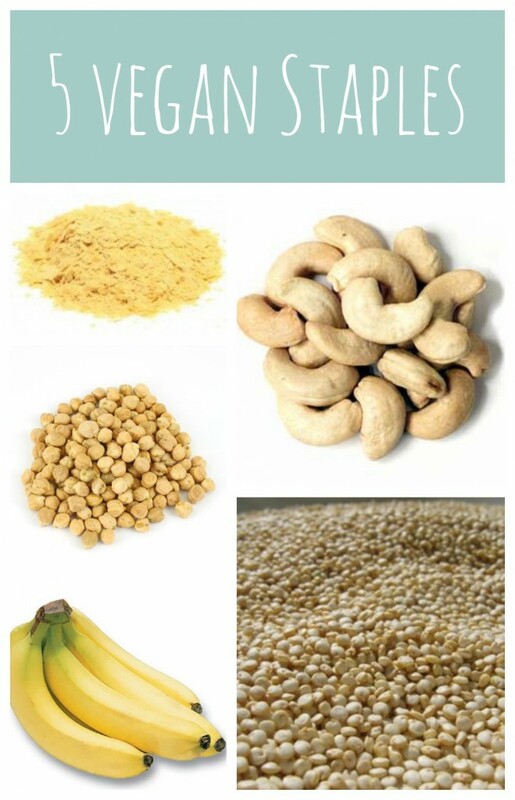 We blend these into our homemade pesto and use handfuls in our vegan mac and cheese (recipes to come soon…). Garbanzo Beans (or chickpeas) – We get these for our homemade hummus and mix them with Quinoa to give our dishes some bulk. They have a wonderful chestnut flavor. We usually have a few cans of these around, but you can also get them in bulk food section. Bananas – Always available and affordable, we eat these as snacks and use them as egg replacements in sweeter recipes. Quinoa (keen wah) – Quinoa is one of the few complete proteins out there for vegans. We eat it about every other night in place of rice. It can go sweet or savory – it is so versatile. What are some of your whole food staples? yay for vegan eating!!!! My staple is avocado – in everything, by itself, in smoothies.. etc. Can't get enough!